New Orleans -- Earlier today, BP executives held a press conference with the intent of helping gulf-coast states, particularly Louisiana, cope and possibly benefit from the oil currently gushing into the Gulf of Mexico. This is seen by many as a nobel and good will effort on BP's part after the recent Top Kill of the leaking well failed. At 1:00 p.m. CST, BP executive Tony Haywood took the stage with a confidence rarely seen in BP executives since the drilling rig, Event Horizon, exploded causing the oil leak in the Gulf of Mexico. Though the press conference way short, Haywood littered his speech with quips and saying such as: "If life gives you lemons, make lemonade. Then open a stand and over-charge people. And, if life gives you scurvy along the way, drink that lemonade." and "Every cloud has a silver lining." and "If life dealt you a bad hand. Bluff your way to the winner's circle." It was clear from the start of his speech -- and his comment defaming those who see the oil spill as a glass half empty when in reality Haywood says that the oil spill is "a glass half full." -- that Haywood is trying to get gulf coast residents to see the oil spill in an optimistic light. Seafood from the Gulf no longer needs to be buttered and fried. Avoid transfats, dangerous peanut oils, and high cholesterol clogging oils and butters by using Gulf oiled seafood and go straight from the sea to the pan in one fluid motion. Louisiana has no theme parks. Louisiana can open the first ever Oil-Land. With such theme park rides as wreck the Valdez, sponge the sea, and save a seagull. In the bayous and marshes of Louisiana open health spas and retreat centers. Offer such unique features as crude oil soaks and skin treatments involving a pumice exfoliating body rub of gulf oil and salts. The rub can be called the Hydroleum Vitalizing Skin Rub. Market it to boogie boarders and wake boarders and the Mecca of boogie boarding. No waxing of boards needed as the oil on the surface waxes your board as you surf. Gold and gem mines have their own pan your for gold attractions of the public. Likewise Louisiana can start a "gather your own oil and learn to refine it" attraction. Participants walk down to the gulf with a bucket and gather their own oil from the coast. Then they separate it from the sea water, process it, refine it, and then take it home. Wow all your friends when you tell them you refine your own oil. Oil, it's what's for dinner. Oil-Aid. Featuring the world's top performers till the oil is cleaned up. 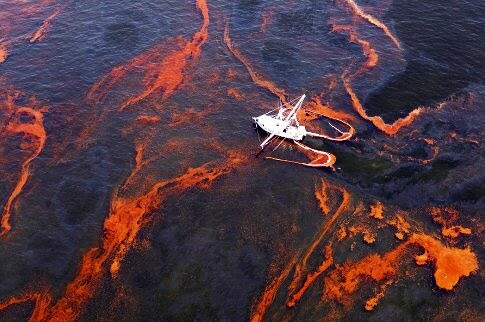 Create a new line of oil spill health products. Better-4-U-Oil. It will feature such things as crude oil caplets supplements, Crude Shampoo and Body Wash (give your skin that luster of a fresh oil spill), Fiber Oil breakfast cereal and bars, Crude oil pitchers to give your filtered water that slick crude taste, and a full range of diuretics and laxatives. Haywood ended the press conference encouraging the local residents to strongly consider these ideas brought forth from a BP panel of uber-thinkers and mind-benders before reminding the residents of Louisiana to always look at the bright side of life and ending the press conference. In light of the long delay, Louisiana residents were not reacting kindly to Mr. Haywood's speech. Some of whom were overheard as saying, "come over to my house and I'll show him what's for dinner." and "I'll refine him!" and "If I ever meet that man in a dark alley I'll give him a skin scrub he won't soon forget." In this time, we all pray for the well being the the Gulf-Coast and its residents. You laugh or you cry. This is a good satire, but the whole situation makes me sick. My parents and brother's family live on the Mobile Bay, so I'm getting lots of on the ground (in the water) updates.